The staff are all very helpful, and try to accommodate me in every way they can. You should visit your dentist as often as your dentist has recommended as detecting decay at an early stage can prevent excessive tooth damage and when cavities are small, they are much easier and less expensive to treat. Early tooth decay does not tend to show many physical signs. Sometimes the tooth looks healthy. By taking an x-ray your dentist will be able to see whether you have any decay under the enamel, any possible infections in the roots, or any bone loss around the tooth. The video:: Teeth have a hard enamel surface. Poor oral hygiene can lead to a build-up of plaque which can lead to decay. If decay is left untreated the nerve of the tooth may become infected and die. This may cause an abscess. 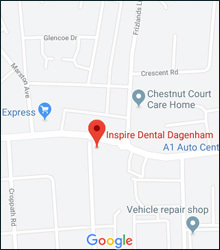 Copyright © Inspire Dental Dagenham. All rights reserved.